I thought it is time to create a new cat meme for my meme collection. I found the image above on my computer and the image is just one or two months old. I wonder why I never uploaded it. Maybe because I have a gazillion of photos and I can´t and won´t upload them all at the same time. This photo of Shyna is in my opinion pretty funny. I was holding her favorite cat treats in my hands but she realized this very fast. You know, animals have a nice scent ability. 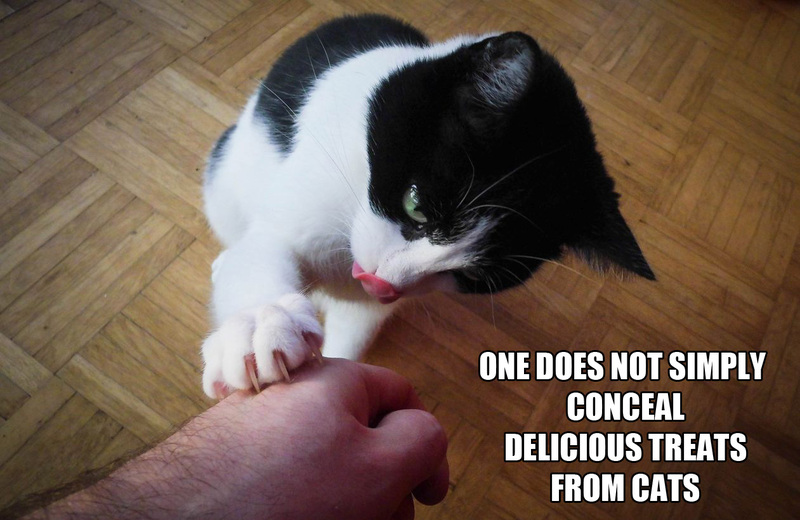 I thought I need to caption this image with the funny text “One does not simply conceal delicious treats from cats”. There are many memes in the internet that start with “One does not simply” but Shyna needs her own! Do you think my caption fits to the photo? How would you have captioned the photo? Or do you dislike captions on photos? Let me know if you like. Hi Dennis, that was a cool photo you took. She even has her tongue already out ! cats also smell things by tasting the air. People do not realize how smart cats are. I love captions on images posted. If the blogger has nothing to say I feel as though I am not in contact with the human being that is out there. Your caption fits, especially if the meme is already in circulation. Word Press is the only network that I navigate… so I am not up to date on other stuff. I also do think it looks super cute that the tongue is already out. I had luck with this photo. Sometimes you click the button in the right moment. The first “One does not simply…” meme was from 2001 or so and it was about the movie Lord of the Rings. A screenshot of the character Boromir was captioned with “One does not simply walk into Mordor”. Mordor is the fictional city. The character Boromir said this line in the movie. This meme became very famous in the internet and many people created their own memes that start with “One does not simply..” but end with a different text because they used it on different kind of photos. It´s funny how memes can get popular and how they change over time because a lot of people create their own. 🙂 This is really an internet phenomena.